Commonly I read biographies of dead white men in the field of science and technology. 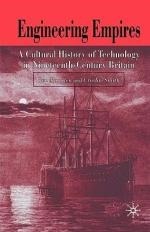 My next book is related but a bit different: Engineering Empires: A Cultural History of Technology in Nineteenth-Century Britain by Ben Marsden and Crosbie Smith. This is a more academic tome but rather than focussing on a particular dead white man they are collected together in a broader story. A large part of the book is about steam engines with chapters on static steam engines, steamships and railways but alongside this are chapters on telegraphy and mapping and measurement. The book starts with a chapter on mapping and measurement, there’s a lot of emphasis here on measuring the earth’s magnetic field. In the eighteen and nineteenth centuries there was some hope that maps of magnetic field variation might provide help in determining the longitude. The subject makes a reprise later on in the discussion on steamships. The problem isn’t so much the steam but that steamships were typically iron-hulled which throws compass measurements awry unless careful precautions are taken. This was important as steamships were promoted for their claimed superior safety over sailing vessels, but risked running aground on the reef of dodgy compass behaviour in inshore waters. The social context for this chapter is the rise of learned societies to promote such work, the British Association for the Advancement of Science is central here, and is a theme through the book. In earlier centuries the Royal Society was more important. The next three chapters cover steam power, first in the factory and the mine then in boats and trains. Although James Watt plays a role in the development of steam power, the discussion here is broader covering Ericsson’s caloric engine amongst many other things. Two themes of steam are the professionalisation of the steam engineer, and efficiency. “Professionalisation” in the sense that when businessmen made investments in these relatively capital intensive devices they needed confidence in what they were buying into. A chap that appeared to have just knocked something up in his shed didn’t cut it. Students of physics will be painfully aware of thermodynamics and the theoretical efficiency of engines. The 19th century was when this field started, and it was of intense economic importance. For a static engine efficiency is important because it reduces running costs. For steamships efficiency is crucial, less coal for the same power means you don’t run out of steam mid-ocean! Switching the emphasis of the book from people to broader themes casts the “heroes” in a new light. It becomes more obvious that Isambard Kingdom Brunel is a bit of an outlier, pushing technology to the limits and sometimes falling off the edge. The Great Eastern was a commercial disaster only gaining a small redemption when it came to lying transatlantic telegraph cables. Success in this area came with the builders of more modest steamships dedicated to particular tasks such as the transatlantic mail and trips to China. The book finishes with a chapter on telegraphy, my previous exposure to this was via Lord Kelvin who had been involved in the first transatlantic electric telegraphs. The precursor to electric telegraphy was optical telegraphy which had started to be used in France towards the end of the 18th century. Transmission speeds for optical telegraphy were surprisingly high: Paris to Toulon (on the Mediterranean coast), a distance of more than 800km, in 20 minutes. In Britain the telegraph took off when it was linked with the railways which provided a secure, protected route by which to send the lines. Although the first inklings of electric telegraphy came in in mid-18th century it didn’t get going until 1840 or so but by 1880 it was a globe spanning network crossing the Atlantic and reaching the Far east overland. It’s interesting to see the mention of Julius Reuter and Associated Press back at the beginning of electric telegraphy, they are still important names now. In both steamships and electric telegraphy Britain led the way because it had an Empire to run, and communication is important when you’re running an empire. Electric telegraphy was picked up quickly on the eastern seaboard of the US as well. I must admit I was a bit put off by the introductory chapter of Engineering Empires which seemed to be a bit heavy and spoke in historological jargon but once underway I really enjoyed the book. I don’t know whether this was simply because I got used to the style or the style changed. As proper historians Marsden and Smith do not refer to scientists in the earlier years of the 19th century as such, they are “gentlemen of science” and later “men of science”. They sound a bit contemptuous of the “gentlemen of science”. The book is a bit austere and worthy looking. Overall I much prefer this manner of presentation of the wider context rather than a focus on a particular individual.